Six of the best from the High End Show 2015 | What Hi-Fi? This year's Munich High End Show buzzed with the usual mix of the exotic and sensible where high-end hi-fi is concerned. It's the kind of show where you can walk into a room and find horn speakers the size of a barn door playing vinyl recorded in the 1930s, then go next door and listen to Four Tet on a pair of high-end headphones fed from a MacBook. As long as it plays music it's welcome here. Walking around the show it's hard to believe that the hi-fi industry has been through such struggles over the last decade. There's plenty of enthusiasm here, and the will to try every avenue to success. Witness how a cable company like Audioquest has moved into digital-to-analogue converters so brilliantly, and how just about every major speaker manufacturer has had a go at headphones and soundbars. Trends? It seems vinyl is alive and kicking in this arena, with turntables galore. There's no shortage of elaborate mechanical engineering here, and the kind of price tags that would buy a decent spec Mercedes. 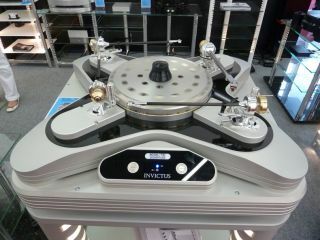 Acoustic Signature's €89,000 Invictus turntable with four tonearms, shown above, is one such example. It also looks like CD is moving aside for computer-based audio sources. There were lots of laptops being used as system front ends, usually feeding an outboard DAC. Most electronics manufacturers make some sort of music streamer now as well, so network audio is now firmly established. The idea of a a specialist hi-fi company making a wireless speaker is nothing new. What impressed me about the Phantom is the ambition of Devialet. This is just about the most technologically advanced product of this type I've seen, featuring the company's innovative hybrid amplifier circuitry in pared-back form. There are four drive units packed into its compact enclosure: two side-firing bass drivers, a forward-facing midrange units with a co-axial tweeter mounted at the centre. The company has also worked hard on the control app - essential in such a product - to make it a seamless experience whether you use one unit or five. The Phantom can be used in mono, stereo and multichannel mode, though movie fans will have to wait for the engineers to get the surround sound decoding fully sorted. A look inside the Devialet shows just how much engineering has gone into this product. The casing uses an aluminium core to help heat dissipation, while the outer skin is made of ABS. The two bass drivers fire in opposite directions to cancel out any forces and reduce the amount of vibration generated by their movement. Mark Levinson is a brand with great history. It can quite rightly claim to be one of the originators of the high-end market. But even those in the company would agree that it has floundered in recent years. There's been a determined effort to improve things, and as part of this the engineers have looked back at the brand's classic products for inspiration. The No.536 monobloc is the result of this rethink. A pricetag of $15,000 and power output of 400 watts into 8ohms which doubles as impedance halves suggests a good start. Focal has had a great deal of success with its high-end Utopia speaker range. The Sopra fits below that and for the moment at least consists of two speakers, a standmount (£8000) and floorstander (£12,000). They're available in a range of colours and incorporate some smart engineering solutions in the form of the cleverly-designed midrange driver surround and the way the tweeter's rearward sound is handled. The speakers look pretty smart to us, too, and build quality is impressive. The KEF Blade has been around for a number of years now, but it still looks great and attracts plenty of attention. Now the company has introduced a smaller version that should work better in smaller rooms. A look at the internals of the original Blade shows just how much work as gone on here. We've already had a look at Astell & Kern's AK500N Network Audio player at this year's CES - and liked what we saw enough to hand out a Stars of CES Award. It's a neat, well made unit with a full range of streaming and ripping features, and a good amount of care taken to make it easy to use. A&K showed the matching power amplifier and rack for the first time at Munich. The AK500A amplifier comes with a separate power supply to minimise any interference. This amp has a fully balanced circuit design with a power output of 2 x 100 watts into 8ohms. Don't be fooled by the size of the power supply unit - the small box positioned at the bottom of the stack - it's a switch-mode design capable of delivering a whopping 1100 watts when required. The whole system plus stand is expected to cost in the region of $16,000. JBL's Everest speakers are considered something of a legend, and rightly so. Their size means they're hardly for everyone, but the horn-loaded design and huge bass drivers give them dynamics to savour. JBL has just introduced new premium finishes, and was showing off the Polar White version. There's a Rossa Corsa option for those that want something more dramatic. Cost? Either option is yours for $90,000. Want more high-end hi-fi? Feast your eyes on our High End Show Facebook photo album.